Escape from the busy cities to wonderful waterfalls around Thailand. Fill your energy and make your life more challenging. 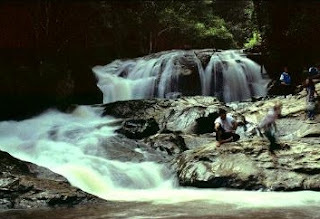 Huay Kaew Waterfall has 2 separate waterfalls, Pha Ngerb and Wang Bua Baan. To have a good view of the falls and enjoy the refreshing and cool shade of the many trees you will have to stray a distance of about 100 metres from the main road in Chiang Mai. The white of racing water stands out dramatically against the deep green of the surrounding forest. However, do check with locals how clean the falls are as during the dry season the sewage from the villages further up the mountain trickles down the falls. Best to sit with a beer or glass of wine at the end of a day and chill out, rather than go for a dip. This is the closet falls to Chiang Mai town, being a mere 10 minutes drive from city center and a great place to relax with a picnic in Thailand. 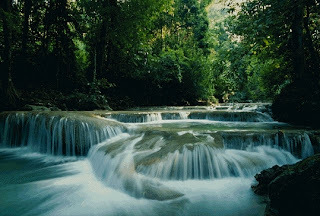 In the interior of Samui Island are a number of waterfalls that can make an interesting change of pace when you tire of the beach scene. The most popular of these are the Na Muang waterfalls, so called because the rock face is purple. 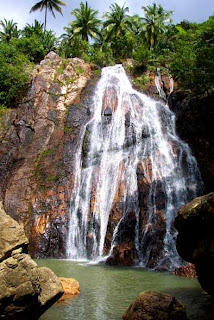 The Na Muang waterfalls lie south of the island's central peaks, at about the midway point between the two coasts. A paved entrance road leads off the main street connecting Hua Thanon, south of Lamai, to Nathon. There are actually two tiers to the waterfalls. The higher tier requires some trekking, on foot or elephant, to reach. The lower tier is 30 meters high with water cascading over a sheer rock face into a deep pool that can be nice for swimming if there aren't too many other people. Along the path leading to the waterfalls from the parking area are several souvenir stalls as well as some food stalls that can prepare 'real' Thai food at quite reasonable prices compared to many of the island's restaurants. Just off the parking lot is a place where you can get an elephant to take you up to the other set of falls, or elsewhere in the interior. Further down the access road from the waterfalls is the self-styled 'Namuang Safari Park' offering elephant rides, monkey shows, and just about anything else to make a buck. Its a bit cheesy but might be good fun if you have children with you. Wang Kwang Waterfall of Thailand is a waterfall where nearest the accommodation just only 750 meters away. It is not very high and looks like a hole down the hill. Nearby the forest, there are many deer so that this waterfall is called “Wang-Kwang Waterfall”. Because of Wang Kwang Waterfall is a crossing for tourist so is not squash. Tum So nor Waterfall in Phukradung National Parks of Thailand. 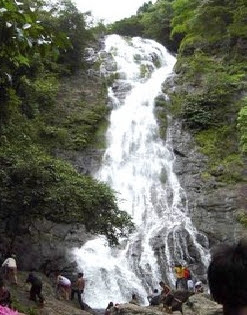 Tum So nor Waterfall is located from Wang Kwang visitor centre about 4.8 km. It is high 10 meters and there is only one level. Tum So nor Waterfall was from the collapse of the land. It also looks like Pen Pob Waterfall. The north area of Tum So nor Waterfall has Rose bush in the summer. You can find more experience at Phukradung National Parks of Thailand. Phuket three most famous waterfalls are not nearby the largest in Thailand and in dry season the waterfalls is not worth a visit. The largest waterfall named Bang Pae is only around 18 meters high, not exactly the worlds largest. So you see there is no need to vast a whole day traveling just to take pictures in front of a "big" waterfall. A much better reason is to get away from the beach and sun if only for a day. But why should someone want to do that? It's easy to have a sunburn on the beach, so visiting a waterfall is your chance to let the skin heal and at the same time experience Phuket only remaining rain forest. Ton Sai and Bang Pae is located in Khao Phra Thaeo National Park 22 kilometers north of Phuket Town on the way to the airport. Also found at Bang Pae is Gibbon Rehabilitation Project where they try to save pet gibbons that have been abandoned. Walking up to Bang Pae waterfall from the parking lot take around 10 minutes. Under the waterfall is a small pond where many people take the opportunity to bath in cool water and jump from the waterfall out in the pond (don't try it yourself if you don't know what you are doing). Ton Sai waterfall is on the other side of the hill not far away from the highway in Thailand where parts of the movie Good Morning Vietnam were filmed. This is a perfect place for picnic in the park, very pretty. Only a short walk from the parking lot. Or you can go hiking and explore the jungle around the waterfall. There are maps of the park and guides waiting to take you trough the jungel over to Bang Pae. Erawan Waterfalls are the focal point of the Erawan National Park. This is an exquisite park, very pretty, and very popular with locals and foreigners alike. The waterfalls are equally exquisite. 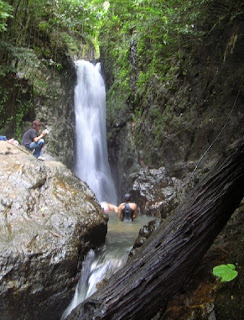 There are seven tiers of waterfalls, each feeding lovely, freshwater pools that you can swim in. A series of tracks lead you to the various falls across wooden footbridges - quite an experience in their own right! The waterfalls can get a bit crowded as they are so popular, so if you are looking for a more solitary experience, you should perhaps look elsewhere. A number of stalls provide staples like grilled chicken and rice along the way, and there is often very much of a carnival atmosphere about the place, especially in April during the Songkran Festival. A visit here will take the day – you should bear this in mind if you have limited time. If you are planning for your holiday. 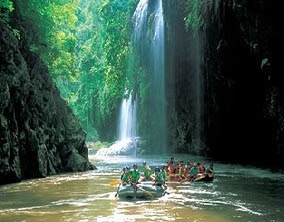 Thailand Waterfalls is a new choices for you. We are offer the top of Thailand Waterfall is Thi Lo Le Waterfall in Tak Province of Thailand. Thi Lo Le Waterfall is located in Umphang house, colour of Umphang house in great flood season is canoe rafting at Mekong River, it is the longest river of Thailand. Rafting at Mekong River, start from Parata house bight to jungle pass to Kota Karens house and you can see Leketi islet, is a long and big several kilometer pass many small waterfalls until at Konmong islet it has a cataract and rocks. Thi Lo Le Waterfall is the most famous rafting paths in Thailand there are many rapids with different levels of difficulty where you can enjoy getting wet without shivering because of the warm weather of Thailand. When you visited to Khao Yai National Park in Nakhon Nayok Province of Thailand. 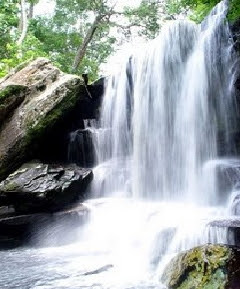 You can enjoy many activity in Khao Yai National Park, also if you are seeking a charming, peaceful for relax with the nature Sarika Waterfall is the place for that. Sarika Waterfall is is the famous waterfall in Nakhon Nayok province, Thailand which used to be a highest waterfall in Thailand. Located at Tambon Sarika, Muang District of Nakhon Nayok Province, the fall is 15 kilometers east of the township along Suwannason Road. Its water stem from Sarika brook flowing from Sarika Mountain. The water will fall from high cliff that’s making the current scatter and it has a big marsh around waterfall which can admit many peoples so you can enjoy your trip here but be careful in raining season because the current will flow fast and strong that’s cause the accidence.